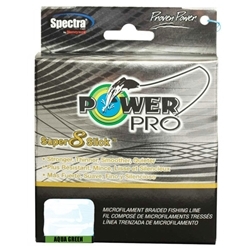 Power Pro's Super Slick Braid was designed to blend into freshwater vegetation and is ideal for flipping, punching, ripping a crankbait through grass or throwing a frog. Super Slick is an 8 yarn Spectra Fiber construction and the Power Pro "Enhanced Body Technology" process creates a stronger, thinner, smoother and quieter line. Anytime you are fishing in or around vegetation, this is your go to color.